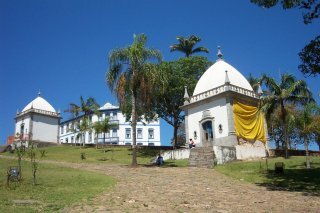 The Sanctuary of Bom Jesus do Congonhas is an ensemble of Catholic religous art, executed in rococo and baroque style. The story behind this WHS is the story of two remarkable men: the Portuguese immigrant Feliciano Mendes and the sculptor Aleijadinho. Mendes as the fundraiser and Aleijadinho as the artist constructed a group of monuments in the city of Congonhas (Minas Gerais) that has been called the best of Brazilian art. After having been miracleously cured of an illness, Mendes used his own money and a succesful fundraising campaign to construct this sanctuary. 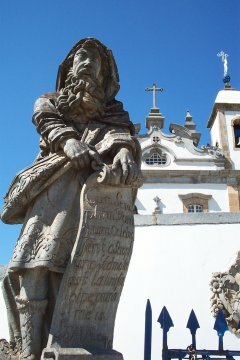 He hired the best artists and craftsmen in Minas to work on the church and its decoration. The master was Aleijadinho (Little Crippled One), the son of a Portuguese architect and a black slave. Although without being able to use his hands and legs due to (probably) lepra, he was responsible for the graceful statues and carvings that can be seen at the site. This review could be titled "Getting there and away". Getting there was much easier than I thought beforehand: there's one direct daily bus at 7am from Ouro Preto. Getting away proved much more difficult: taxi's and buses are very scarce in the surroundings of the Basilica to take you away. 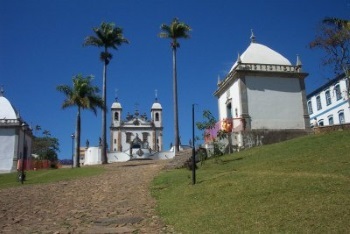 As are buses back to Ouro Preto - I eventually got there again after a 3 hour wait in the village of Ouro Branco. The church and the chapels are extremely picturesque. Set on a steep hill, towering above the humble buildings in the neigbourhood. A clear blue sky as its background. The statues of the prophets are unique pieces, each with its own pose and character. It's good to just sit here and awe. Unfortunately, you cannot get in at the moment: there are restoration works going on inside the church and some of the chapels. I'm sorry to have missed the rococo interior of the church. The cedarwood carvings representing the stations of the cross are truly magnificent. I really enjoyed them. lots of details and nice colors although a bit dusty. The 12 prophets made from soapstone are also very detailed. Museums were closed unfortunately but the rosaria I could have a look around although not inside. A WHS I highly recommend visiting. Not because it’s huge but because it’s unique. Visited in Nov 2018 as a day trip from Belo Horizonte. Due to disappointingly frustrating bus connections to the other neighbouring towns, this is the best way to visit. There are buses almost hourly throughout the day to BH though. With that in mind, it is worth the trip out. The church is nice, but The Prophets are fantastic and really set the site apart. The best approach is to come up the steep hill on foot, passing the chapels and building up to the Prophets above to get the full effect of their majesty and power and overall setting as it was intended. Unfortunately there isn't much else in Congonhas worth lingering for so make sure you have an exit strategy, however you arrive. Conghonas is a rather unusual WHS. I think it is true to say that there are no other (?) cultural WHS whose design and “manufacture” can be identified as the work a single named individual. The nearest which come to my mind are buildings by architects such as Horta and Rietveld Schroder and they clearly didn’t do the construction as well! (Similarly with Michelangelo’s role at the Vatican!) Recognition and preservation of the World’s “Fine Art” has not been dealt with by UNESCO under the Cultural Heritage banner which requires that such heritage be “sited” whereas much of such art is movable and therefore excluded. Yet, although the Basilica of Bom Jesus at Conghonas is technically inscribed as a complete building in its own right as well as for 2 associated works of art, it is for those works of art by one man, “Aleijadinho” that it is primarily recognised (In the case of the second work he did have the help of a few assistants/pupils as has often been traditional with large religious works),. The story of Aleijadinho is the stuff of legend. The son of a black slave and unable to use his arms or legs after contracting leprosy in his youth he somehow learned how to sculpt with a hammer and chisel strapped to his arms. The “Prophets” were created at the start of the 19th century when he was already well into his 70s. They are no doubt recognised as artefacts of “outstanding universal value” not just for their intrinsic artistic value but as representatives of the development of Baroque art in Latin America. Congonhas itself is a rather ugly and uninteresting town – do not confuse it with other wonderful “colonial” towns in Minas Gerais (2 of which are WHS and others of which could justifiably be!). As you only need a couple of hours for the site the essence of planning a visit to Conghonas is to arrange to get in and out on the same day e.g. on a trip to or from Ouro Preto. 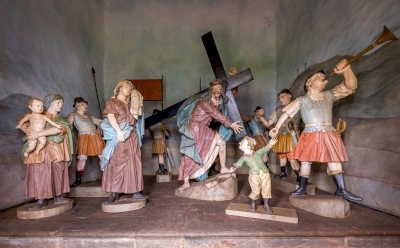 It is worth remembering also that the churches in a number of the more attractive nearby colonial towns such as Tiradentes and Mariana also contain work by Aleijadinho. On that basis, it is in my view worth making the detour to Congonhas even if you are not a great aficionado of baroque art. The Brazilians regard him very highly and to see and appreciate his works is to take a step along the way of understanding the development of a separate Latin American and particularly Brazilian culture.